An honest conversation about the wage gap between men and women: Why is it so hard to fix? Why Is It So Hard to Fix the Wage Gap? 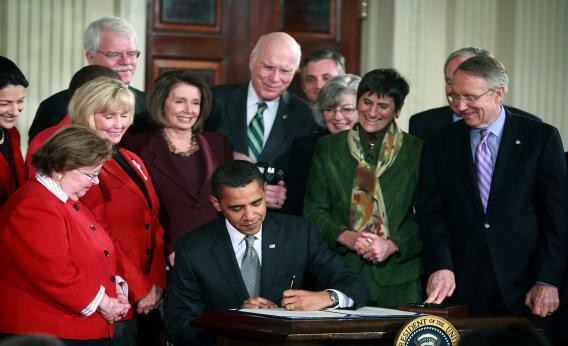 Obama signed the Lilly Ledbetter Fair Pay Act in January, 2009. It’s not enough. Every four years, Americans convene to discuss the social issues and governmental policies most important to our nation, and then Photoshop our chosen candidate onto the back of a unicorn. This year, I’ve grown increasingly wary of how the candidate’s platforms and the people’s Lolcats collude to simplify the complex issues we should be discussing long after November. One casualty of this election: An honest conversation about the wage gap. In the second presidential debate, pre-K teacher Katherine Fenton asked the candidates, “In what new ways do you intend to rectify the inequalities in the workplace, specifically regarding females making only 72 percent of what their male counterparts earn?” In case you were busy Tumbling Trapper Keepers: President Obama pointed to enforcing equal pay for equal work, improving health care, and doling out college grants. Mitt Romney spoke to promoting women in the workplace and in politics and providing more flexible work schedules. But as we all rushed to take sides and create memes, the actual sources and state of the persistent pay gap Fenton mentioned went unexamined. Fenton’s 72 percent figure overstates the gap, but a true figure is difficult to pin down. Cornell labor economist Francine Blau sets the current wage gap at 77 cents on the man’s dollar. Comparing full-time working men and women, the Bureau of Labor Statistics has found that women make 81 percent of what men make. The gap is highest for women at the top—among lowest-paid workers, women make 90 percent what men do. A new study out today from the American Association of University Women shows that among recent college graduates, the pay gap kicks off at 82 percent. Even when male and female students graduate with the same major from the same college and enter the same industry, women stand to make 7 percent less. The gap increases from there. Those numbers are evocative, but the “wage gap” is a deceptively simple term for the complex differences that persist between male and female workers in our big, gendered economy. The figure is really a snapshot of how women are undervalued across the workforce: It speaks to an occupational segregation gap, a negotiation gap, a promotion gap, a self-promotion gap, a mentorship gap, a parenting gap, a STEM gap, a political representation gap, and an overt discrimination gap. And still: Part of the wage gap remains unexplained. We do not know exactly why women are paid less. We do know that targeted legislation like the Lilly Ledbetter Fair Pay Act is unlikely to make up the difference. Equal pay for equal work is a simple concept, but discrimination against women in the workforce is subtle and complex, and not always, or usually, fixable via lawsuit. Women are faulted for not advocating for themselves more, but they’re still docked for seeming overaggressive or under-nurturing. When the state of Minnesota audited its own public sector payroll, it found that male-dominated positions were paid more even when accounting for the demands of the work, the expertise required, and the conditions on the job. While overt discrimination at work has dropped in the past few decades, the “unexplained” wage gap has risen, perhaps predictably—cutting back on announcing sweeping prejudices against women does not mean we don’t still have them. And these unexplained factors become more intense as women advance in the workplace, rising from 5 to 12 percent within a decade of college graduation. And the pay gap only tells part of the story about women’s economic challenges. The pay gap is bad, but the wealth gap is dire. Women aged 18 to 64 have only 36 percent the wealth—assets minus debts—that men their age do. And women’s individual efforts to close the pay gap can exacerbate it. When a woman secures a PhD, she can finally make as much money in her lifetime as a man with a Bachelor’s degree. But that investment comes at a significant cost: That new AAUW study shows that women are making less money straight out of college, and they’re sinking a higher percentage of their income into college loan debt. Eliminating the pay gap is not just a matter of paying women more. It will require an effort from all sides, and the government can only do so much. A 2007 report from the AAUW recommended that the pay gap be bridged by the combined effort of individual workers, leaders in the private and public sector, and governmental policies—a combined Obama-Romney approach. Blau told the Atlantic that while enforcing anti-discrimination law is important, the pay gap will only disappear with “voluntary changes” from individuals across the economy. That means men mentoring women, fathers taking care of kids, employers setting flexible hours for everyone, young women learning to navigate the sexism of salary negotiation and promotion, teachers recruiting girls into math courses, men stepping into traditionally female fields, industry leaders reconfiguring business practices to accommodate all work styles, changing our perspective on productivity, everyone stopping being so unconsciously sexist all the time, and the government helping out where it can—by setting supportive policies on healthcare, childcare, and gender discrimination, and promoting female workers in government, too. We can argue as to which candidate got it the least wrong at the debate, but I’d rather that we all start talking more seriously about what we each need to do to make it right.